Kaylie Kappelmann, first-year psychology and nonprofit leadership major, has played soccer since the age of three. The Olathe, Kansas, native sat down with the Monitor to discuss her first taste of college athletics. Kappelman is a goalkeeper on the womens’ soccer team. She commented on how the season has been going so far. “Our first game we lost, but since then we’ve been so much better; like, we haven’t lost since. We’ve really been coming together. We’ve been scoring a lot, and I finally got my first shut-out recently so that was nice,” Kappelman said. Kappelmann’s main goal for the season is to make it to – and win – the league tournament. Her competitive nature is a big reason why the decision to play college sports was an easy one. Playing college sports comes with plenty of challenges, both on and off the field. Kappelmann laughed when speaking about the amount of laundry that piles up as an athlete. She notes time management and motivation to be the biggest obstacles. “Motivating yourself when you are at the tiredest, sorest point in your life, and you’re like ‘I still have an essay due tomorrow but I want to sleep,’ and you still do your essay – that’s pretty difficult,” she said. She finds exercise, hanging out with friends and painting to be great ways of dealing with the stress of college life. Soccer practice is a way that she can forget about the difficulties of school and have fun. The challenging academics of William Jewell College are a big reason why Kappelmann chose the school. Another reason Kappelmann chose Jewell was her positive interactions with the coach and the other players. 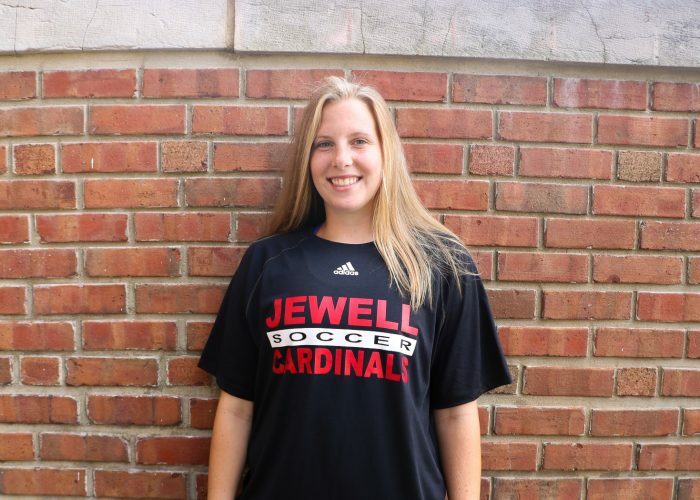 She says that she is very happy with her choice to play soccer at Jewell.